I always have a hard time finding the right red because bright red doesn't look good on me at all. I'd like to try the one by Clarins. I can't pull off red lip stick. I have to have a more muted color. I always wish that it looked better on me! I love wearing red lipstick during the holidays. It makes me feel festive. And I have learned that there is a red for EVERYONE! Red is the perfect color for Christmas! I don't always use red but Christmas I think I always use it. I will have to try these brands! I do love the color red! I need to get some lipstick. I really don't wear it much though. I don't like when it gets on glasses and such. I always have a tube of red lipstick in my purse or clutch. It's a go to color that works for everyone. I love a bold red lip for Christmas time. These are some awesome suggestions!! Can't wait to try some of these at the store! 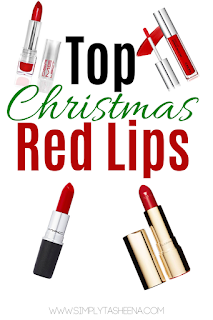 A classic red lip is always in style, especially around the holidays. These are some great options. I am not one of those people who can pull off a red lipstick. But it's definitely the perfect holiday color! Every woman needs a red lipstick. I was thinking of buying one for New Year! Thanks for your sugestions. All these red shades look terrific. They match the Christmas mood with their elegance and vibrant look. These suggestions are timely for the festival season. I love all these colors of reds. I think it's great to go bold with red. It's one of my favorite lipstick colors too. I love red for lips. I don't wear it all the time but, I do rock it often. Once you find your shade, you stick with it. I'm always afraid to try a bright red lipstick. I'm more of a gloss gal, but recently I bought a matte liquid one. Love this bright red color lipstick. Looks really very nice for holidays. I love red color for my christmas party makeup.